This World of Good, making your feet not only look good, but feel good, too, post has been brought to you by Earth Footwear and Mamavation…. As some of you may or may not know I was chosen to be an Earth Footwear Power Pinner for this month. It has been a blast pinning #WorldofGood things I’ve found. Check out my #WorldofGood Pinterest Board to see the things that inspired me this month. As I mentioned in my earlier post, a World of Good means a lot of things to me, from donating to charities (locally to globally), to volunteering at my son’s school, to taking care of myself — my own little world. Because if I’m not at my best I can’t be a ‘World of Good’ to anything or anyone else. I would love to know what a “World of Good” means to you. I have some great news… Earth Footwear would like to give a little ‘World of Good’ to one of my readers! I know, awesome, right? NOTE: Earth Footwear’s Spring/Summer collection has been selling like mad, so the winner will be receiving one of the popular shoe styles chosen by Earth Footwear. Although you are telling me your favorite pair in the comments… there is no guarantee that will be the pair you will receive. Giveaway is open to U.S. residents ONLY 18+. Ends May 4, 2013. Enter on the Rafflecopter form below. Good luck! I like the red earth wellness shoes. Their website is broken 🙁 When you click the link (or any link on their homepage for that matter) you get – – Sorry, you have encountered an error with our site. Please click the browser’s back button to try again. If the problem persists, please call customer service at (877) 372-2814. Can’t open any links on site?????????? Love earth shoes, so any would be great. I looked at some of their stuff before, they look great. think like santini, great shoes. I’d love the red caraway sandals! I like the Kalso Earth Prosper sneakers. I’d most like to have The Willow. I like the Sugarpine or the Willow. I like the Sugarpine shoes!! the gale looks really nice!! I love and will be getting the Gale, Willow and the Alder. I love all three of them. Not sure about the colors yet. 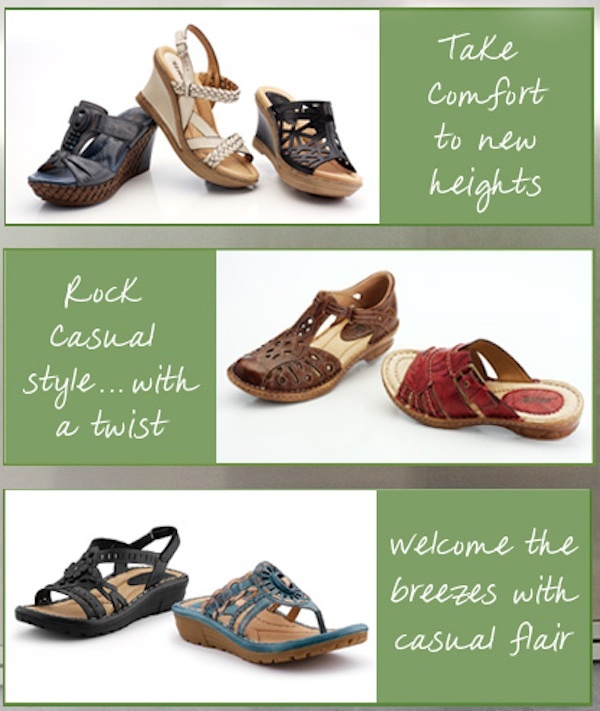 I LOVE the Eden in either color – beautiful and look so comfy! I really want the Gale. So pretty! I like the Toro in teal. They are an Earthies shoe. I like the Tabasco Sandal the best in Black! I love the Eden in black but I also love the Dune boots. I love the Downeaster Sandal! I like the Willow in Red. I would pick The Alder in black! I will need to try the on but I do like the earthie ob.